The town of Westfield in Union County is home to more than 30,000 people and is well-loved for its downtown shops and easy access to NYC. Students in Westfield attend the Westfield Public School system. There are currently 56 homes offered for sale in Westfield. 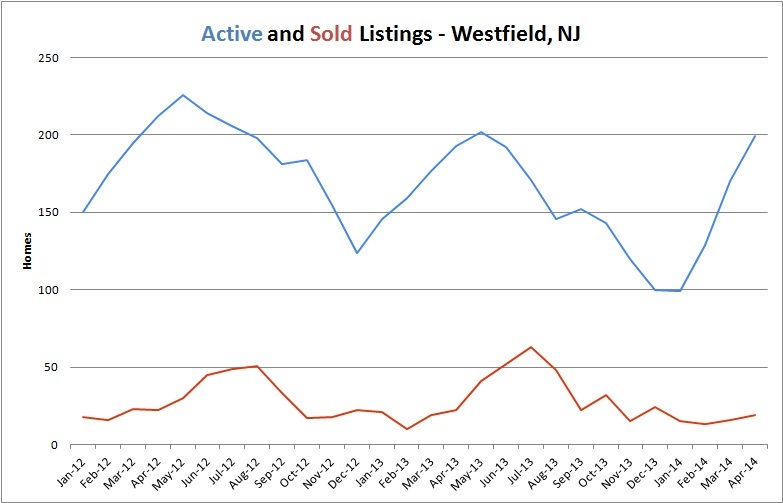 This is the lowest inventory Westfield has seen in years. As inventory drops, prices often rise, so buyers need to act fast if they want in! 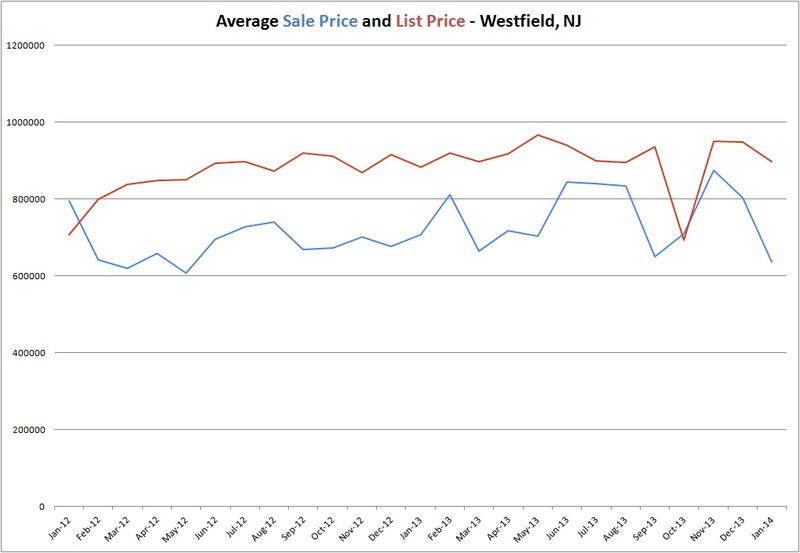 Prices have held stead in Westfield with a few bumps this fall. As prices recover, the average sale price in January was $634,893 which is 21% lower than in December of 2013 and about 10% lower than January 2013. To find out how much your home in Westfield is worth, please click here. To search for a home in Westfield, please click here. Time to Buy in Union! Union, NJ, is home to nearly 57,000 people. It occupies northern Union County in the area that was called Connecticut Farms in the 18th Century. There are six primary (PreK-4) schools: Battle Hill School, Hannah Caldwell School, Connecticut Farms Elementary School, Franklin School, Livingston School, Washington School. Central Five-Jefferson School serves grade 5, and Burnet Middle School and Kawameeh Middle School serve grades 6 though 8. Union High School serves 2400 students in grades 9-12. There are currently 241 homes offered for sale in Union. After a bit of a dip last month, the inventory has partially recovered but is still lower than it’s been in years. Low inventory may bring higher prices – as demand out-buys supply, prices tend to rise. Prices in Union took a bit of a dive this winter, so spring should bring a correction. 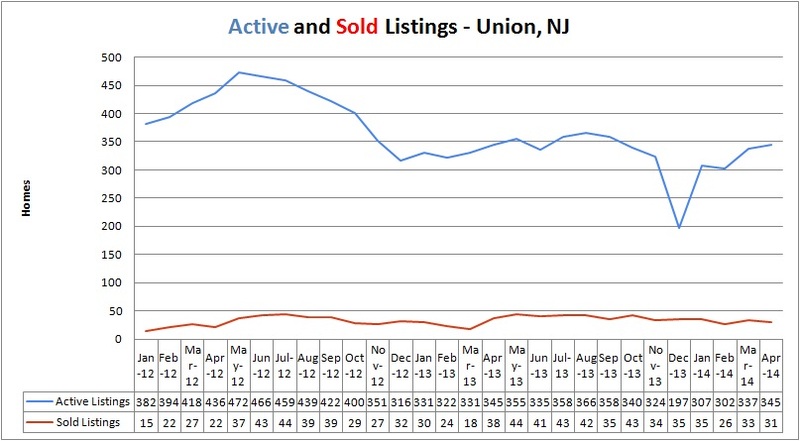 The average sold home in Union in January was sold for $229,100, about 25% lower than January of 2013. As the temperatures rise in the spring, prices may rise as well. In the meantime, if you are selling a home, make sure you’re list price is at or below market value to ensure that your home sells within a reasonable amount of time. Keep up with the maintenance of your home – don’t let it look run down or outdated, or the value will drop and buyers will walk past. Homes are taking longer to sell than they did last summer. In July, 2013, the average Days on Market was 71 days and in January, 2014, that number had increased to 113 days. If you want to buy a home, this may be the best time for you! If you’re considering selling your Union home, call us today for a free comparative market analysis of your home. 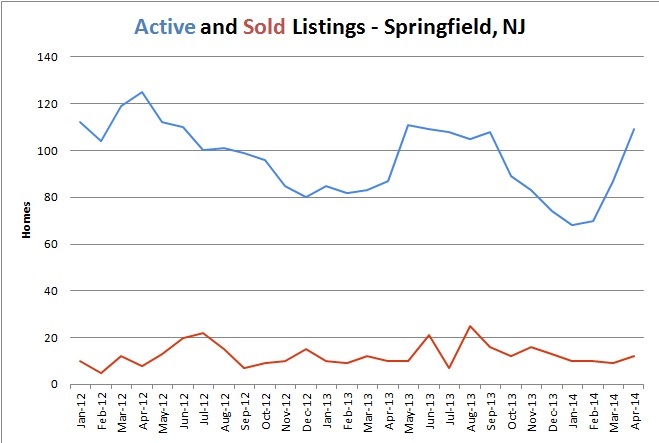 Low Inventory in Springfield Real Estate Market! The Township of Springfield, NJ, is home to nearly 16,000 people and is the home of Baltrusol Golf Club. It is also the location of the Battle of Springfield which was the last battle of the Revolutionary War. There are currently 51 homes offered for sale in Springfield. This is the lowest inventory Springfield has seen in years, so now might be the time to sell. Low inventory nearly always results in an increase in prices because the supply is quickly used up by the demand. And that is exactly what we’re seeing in Springfield prices. The average home sold in January was sold for $351,875 which is about 8% higher than January of 2013. As the spring market kicks in, I wouldn’t be surprised to see prices climb. Home sellers in Springfield often want to know how long their home needs to be on the market before it sells. Of course, factors such as pricing and condition affect the length of time it will take to sell your home. Pricing your home at market value (your REALTOR can help you with that) and keeping the condition of your home good can help sell your home faster. 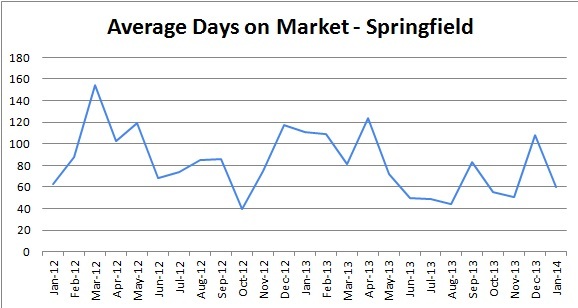 On average, the homes that sold in January in Springfield sold after about 2 months on the market. For a January market, this is very fast. Who knows what spring will bring? If you have a home in Springfield that you’d like to sell, contact us for a free comparative market analysis! About 23,000 people live in the beautiful Union County town of Scotch Plains. Many of those people take advantage of the 45 minute easy commute via New Jersey Transit to Manhattan. Public school children in Scotch Plains are served by the Scotch Plains-Fanwood Regional School District and attend Howard B. Brunner Elementary School, J. Ackerman Coles School, Evergreen School, William J. McGinn School, School One, Park Middle School, Terrill Middle School, and Scotch Plains-Fanwood High School. The Union County Vocational Technical Schools are in Scotch Plains as is Union Catholic Regional High School. There are currently 80 homes offered for sale in Scotch Plains, ranging in price from $135k to $1.56M. This is a lower inventory than most of the past 2 years, but not abnormally low for the middle of winter. I’m sure that the inventory will rise as the temperatures rise. 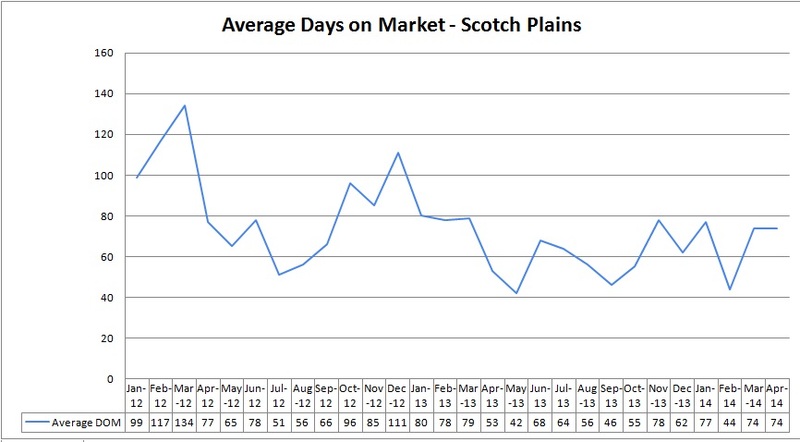 Prices in Scotch Plains continue to fluctuate. 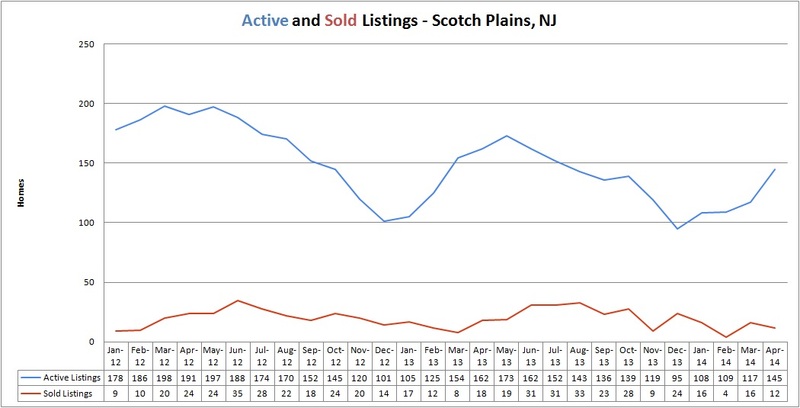 The average price of a home sold in January in Scotch Plains was $438,533, down slightly from the end of 2013. Homes in Scotch Plains continue to sell more quickly than the rest of Union County. The average home sold in Scotch Plains in January sold after about 3 months on the market, much faster than last winter. Team Zuhl is here to help you every step of the way. Please call or email us when you’re ready to get your home on the market! Good luck! When we go out tonight, I’m unplugging. How many times have you seen a table full of people at a restaurant and every one of them is looking at their cell phone? How many times have you seen a couple together, each staring at their own phones? My partner deserves better, and so do I. Our clients can reach us on our cells day or night and we’re available to them. Can we say the same for our loved ones? Just turn off the phone tonight, folks. Let your loved ones know that you love them more than your Twitter. Give the people in your life facetime, not Facebook. Chat instead of SnapChat. Talk to your partner, not to Her. When the day is out, it’s the time I spend with the people I love that matters, not the newsfeeds I read. Put your phones together on the table and whoever picks theirs up first has to pay. Make a game of it. If you need to, use an app like Unplugged, Freedom, Unplug and Reconnect, Pause, and brb which can all help us be more present for the people we need to be present for. 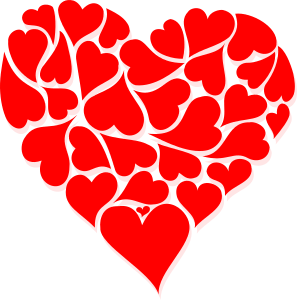 Happy Valentine’s Day, Folks! Enjoy the time you spend with your people! How do I obtain a CCO in Clark? A CCO, or Certificate of Continued Occupancy, is required in many areas of New Jersey and elsewhere before the title of any real property can be exchanged. When you sell your home, it’s important to know what your town requires for a CCO. To obtain a CCO in Clark, you’ll need to fill out the application which can be found here. If you are selling your home with the assistance of a full service Realtor, he or she will likely file this for you, but if you are selling FSBO, then you’ll need to do this yourself. Once the application and fee are received, the Construction Department will schedule an inspection of your home. Open permits must be closed out before the CCO inspection. The blow off valve on your hot water heater must be at least 6 inches off the floor. The electrical service in the home must be at least 100 amps. All outlets in the bathrooms and within six feet of the kitchen sink must be GFI (Ground Fault Interrupter) protected. If there is a sump pump, it must not discharge through the sewer. There can be no cracked or broken windows. All staircases 36 inches or higher must have railings. The outlet for your laundry appliances must be GFI protected and be installed within six feet of the appliance. There can be no extension cords in the property. Asbestos must be removed or encapsulated if it is deteriorating. The fee is $75 in Clark. Checks should be made payable to the Township of Clark. The certificate is good for 180 days from the date of issuance. Clark also requires a Smoke Detector/Carbon Monoxide Certificate prior to the transfer of title. The cost for the certificate is $50, made payable to the Township of Clark. The application can be found here. All Clark homes are required to have a smoke detector on each level and one outside of each bedroom. In Clark homes built before 1984, individual battery operated detectors are acceptable. In homes built between 1984 and 1990 the detectors must be interconnected so that if one goes off, it activates all of the others. In homes built after 1990, the detectors must be interconnected and must have battery backup. Carbon monoxide detectors, UL-2304, must be installed in the immediate vicinity of each bedroom. Your home will not be issued a Smoke Detector/Carbon Monoxide Certificate if a key is required to exit the home from any door. You also must have a minimum 5 pound ABC dry chemical fire extinguisher in the kitchen area. Homes must be numbered to be issued a Smoke Detector/Carbon Monoxide Certificate in Clark. The form for the CCo and the form for the Smoke Detector/Carbon Monoxide Certificate, along with the appropriate fees, should be submitted to the Clark Construction Office at least 2 weeks before your anticipated closing date to allow time for an inspection of the home and for filing of the certificates. When Abraham Lincoln won the election, many people were unhappy. Plots were hatched by secessionists to assassinate the President-elect before he could reach the Capital for his inauguration on March 4th. The US Army Commander-in-chief Lieutenant General Winfield Scott heard the rumors from Charles Pomeroy Stone and named him the Inspector General of the DC Militia. Back in the 1860s, there wasn’t an official military intelligence agency, so Stone relied upon private detectives to provide him with information on any assassination plans. 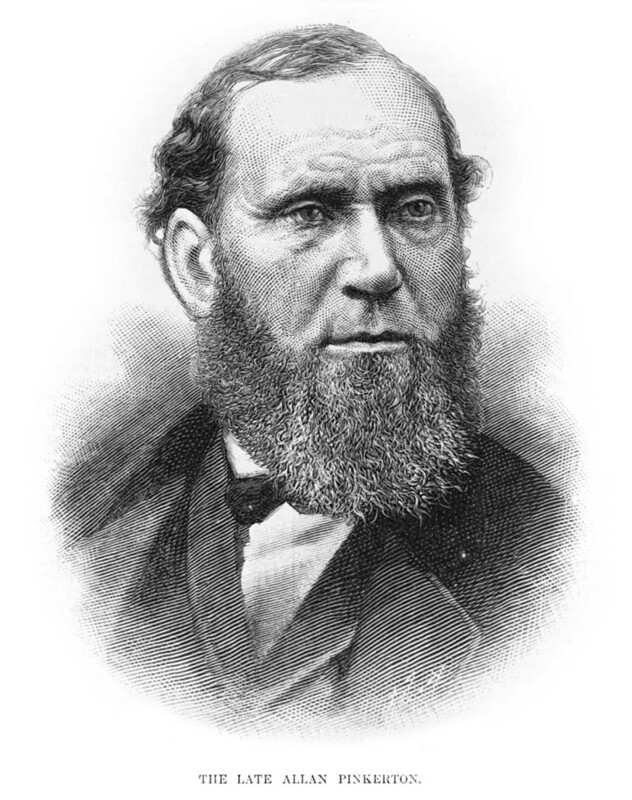 One of the detectives, Allan Pinkerton, was a Chicago police detective and was famous for solving caess of railroad robberies in the Midwest. He learned that a group of men were going to attempt to assassinate the President-elect on the road from Harrisburg to Baltimore so Pinkerton convinced Lincoln to change his schedule to foil the plot. From February 11th, 1861, until March 4th, Abe Lincoln rode a train from Springfield, Illinois, to Washington for his inauguration. He was accompanied on this trip by Pinkerton and Kate Warne, the Country’s first female detective. 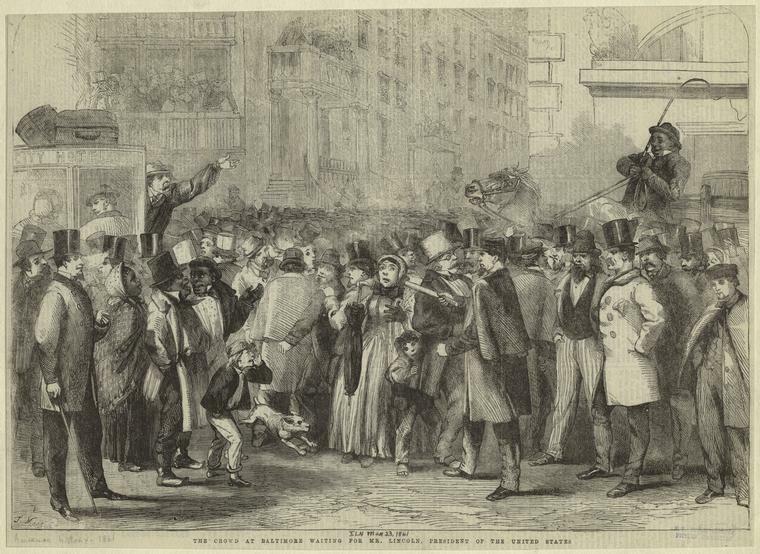 Pinkerton and Warne heard rumors that crowds of secessionists would storm the President while he was addressing the crowds in Baltimore and then they planned to kill him, escaping to the South. On the night of February 22, 1861, the telgraph to Baltimore was cut off to prevent communication from passing between any potential conspirators. Agents were placed in telegraph offices to intercept any messages about Lincoln’s travels. Pinkerton arranged for Lincoln’s train to arrive in Baltimore very early in the morning of February 23rd and then Lincoln was switched to another train which arrived in Washington at 6am. When crowds gathered in Baltimore that afternoon, they were surprised to learn that Lincoln had already left. Later, Lincoln expressed regret that he had had to sneak into Washington. No one was ever arrested for an assassination attempt, and some theories say that John Wilkes Booth was active in the plot. Other theories say that Pinkerton’s theories were incorrect and there were no assassination plans at all. Even if there were no plots, others say, the people of Baltimore were bitter toward Lincoln and violence might have eruptied anyway. Harper’s New Monthly Magazine covered the story. Hour of Peril is a book written by Daniel Stashower last year and tells the story of the Baltimore Plot in detal. The 1951 MGM movie The Tall Target is a fictional account of the story. Smithsonian.com tells the story here. How is this related to Union County? The man who cut the telegraph lines was William P. Westervelt, resident of Cranford.